Normal - this is the default view of the cards that takes into account users view settings. Compact - this view displays the cards minimized with only the essential card parameters like: title, assignee, and blocked status. You can also see the color notation configured for your card. Bird's eye view - this view of the board is an entirely minimized mode only displaying the color notation of each card as well as blocked status (if present). It allows you to see a bigger portion of the board that helps get a quick glance idea of how stable your workflow is across stages. This is particularly useful when you have a lot of cards stuck in a certain column. You can now link a card with more than one Parent cards. This way a card can be a part of several strategic initiatives. Moreover, when a card that concerns your project is dependent on a different team, you can monitor its progress in your own initiative view without the need to switch to a different board. If you are not sure how to create links between cards, please check our dedicated article. The card mirroring feature allows you to clone an existing card that is in any type of relationship (parent, child, successor, predecessor). The mirror card is automatically linked to the original card. When one of the cards gets updated, the other automatically syncs its modified data. 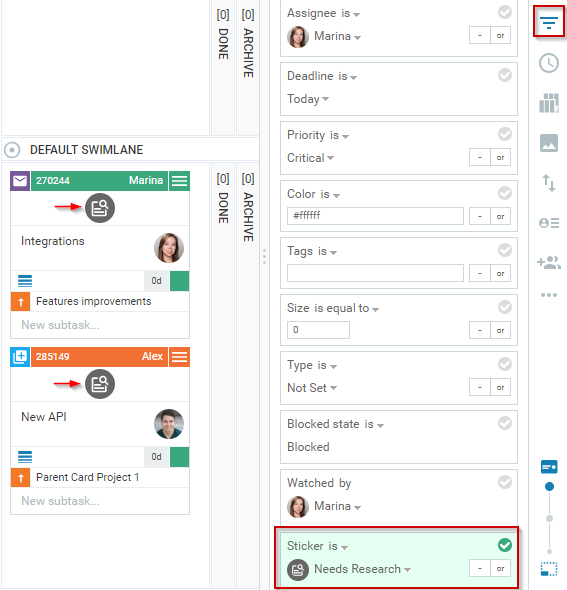 A card linked as a mirror preserves the task details, sub-tasks, comments, but at the same time, both cards have their own workflow and time metrics. This supports use-cases in which multiple teams work on the same business requirement and aim to add different value to their product or service. 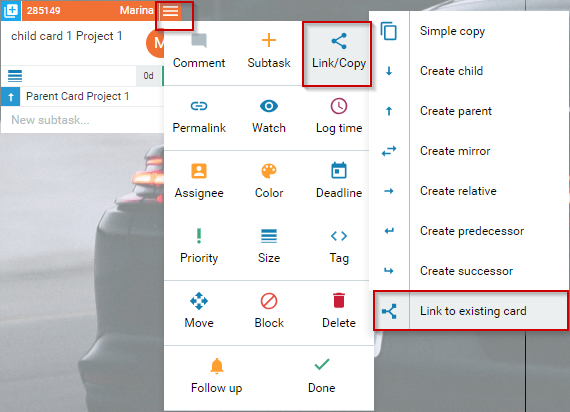 To create a mirror card -> right click on the card to open the Card Context menu -> select Link/Copy -> Create Mirror. A new short-cut option is available in the card context menu that makes it easy to link cards. Use the "Link to existing card" option to link the respective card to any of the existing cards in the account. To search for a card, use its ID or Title. The stickers are added as a component of the Board filter. Users can filter out the cards marked with a specific sticker by activating the Sticker component. Android - use search filters as home screen widgets. iOS - use search filters as Today widgets. The analogue of home screen widgets in iOS is Today widgets. After you update to the latest version of the app, go to your Today screen and scroll to the bottom - there should be a note that you have new widgets available. Tap Edit and you will see a list of the 5 built-in search filters - "Assigned To Me", "Blocked Assigned To Me", "Overdue Assigned To Me", "Overdue" and "Initiatives In Progress". Choose the ones that you want to keep an eye on and there you go. 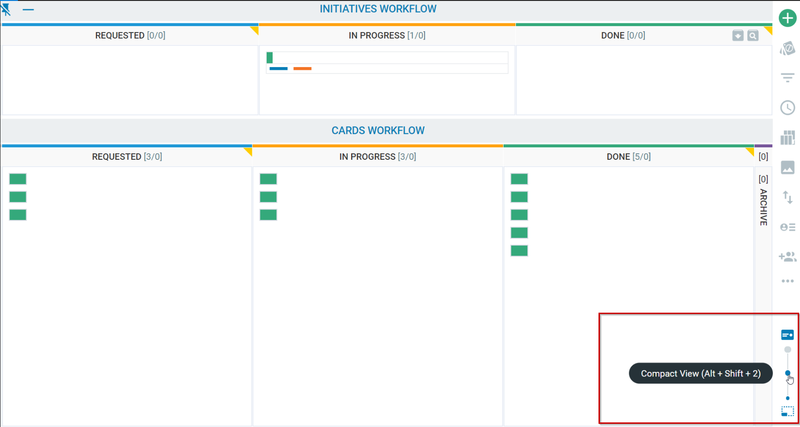 - In Kanbanize 6.4 we slightly changed the board design for a better UX and visualization. All column and lane headers now have a larger font size to become more noticeable. - For those users who have integrated email addresses with Kanbanize and send emails from the card Comment tab -> the "Reply to All" option is available. - New resources are available in our API that allows management of all type of card links. Please, review the API documentation here.